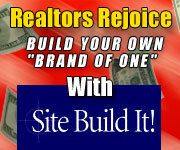 Profiting from real estate internet marketing means turning website traffic into website leads. By boosting the number of leads you get from your real estate websites, the opportunities to turn the leads into prospects are exponential. Here are 5 real estate internet marketing ideas from Jamey Bridges to get you started. Marketing your real estate business online is a fun and exciting process. After all you can implement new ideas for very little money and you can see near instant results (good or bad). One of the hardest aspects is what do you try next? With internet marketing you don't have to be crazy or extremely creative to implement an idea that captivates your audience, sometimes it just takes the right spark to get you going. Here are some internet marketing ideas that will shake up the "norm" and get some fresh activity from your online efforts. Give it a whirl and see which one catches your attention. Change your home page - I mean totally change it. For many real estate websites, the home page can be a source of 40% or more of the total traffic, but what kind of results are you getting from it? Go crazy, put some new pictures up, change the content, put up a new opt-in form, and just make major changes. Don't just change the headline, go crazy and see what results you can get. If you are nervous about such a major change, just save a copy of your page first. Record video - Too many people are scared of video so be bold and put some video on your website. You don't have to be Stephen Spielberg, just grab a camera and start shooting some of the neighborhoods that you work in everyday. Be bold and create a series like "Walking through the Streets of MyNeighborhood" where you literally create videos of you walking different streets. You can narrate the video as you walk! Unlock the power of your social network in real estate to close at least 2 transactions monthly. Discover the methods, systems, and techniques to use on any social network that will have you growing a group of raving fans that feel compelled to send you business every month. Save time and get social networking to start working for you from the very moment you start. Grow that social network - Maybe you have been signed up with Facebook, Twitter, ActiveRain, or one of the others for awhile, but what have you done with it? Go login and start making some new connections. Don't just ask someone to be your friend though, add real value, ask them how their business is going and maybe even share the latest tip you are using to generate leads online. Everyone enjoys a friendly new idea so start off your new relationship by sharing. Guest post - Having a blog is great, but when is the last time you reached out to a fellow blogger and asked if you could write a guest post? As bloggers we are always looking for fresh new contributors so reach out a city that has common relocations to your area and see if you can write a guest post about what's going on your area. You may even get the opportunity to establish a great referral connection with that other agent. Host an online tele-class - Change that normal buyer seminar you do to an online version. There are some great products out there that even allow you to host free conference calls so you don't have any excuse. Send a blast e-mail to your database and share some of the latest challenges (and how you can be the solution) for buyers in the market and watch the leads pour in. Real estate internet marketing ideas don't have to be as big as creating Google to work, sometimes it just means making a change and seeing what happens. So you only have one question left to ask, which idea are you going to implement? All aspects of real estate internet marketing and conversion are covered from Search Engine Optimization and Pay Per Click to Social Networking. Training programs are designed to help agents understand what is needed, apply the methods, and see results each and every month. He and his twin brother even developed a free ebook so real estate professionals can get started in the world of online marketing quickly. Get the training and coaching you need Online Real Estate Success. Real estate internet marketing is about implementing ideas and staying focused. Avoid the customary real estate marketing plan that loses steam within a few months. As the old saying goes: "If it ain't broke, don't fix it. But if it's broke ... fix it and fix it quick!" Free 5 Day SEO Course– Discover the simple methods that will get you to the top of the search engines and bring you fresh new leads for your real estate business. Some Fundamental Elements Of Real Estate Marketing Online. Selling Real Estate With a Twist!